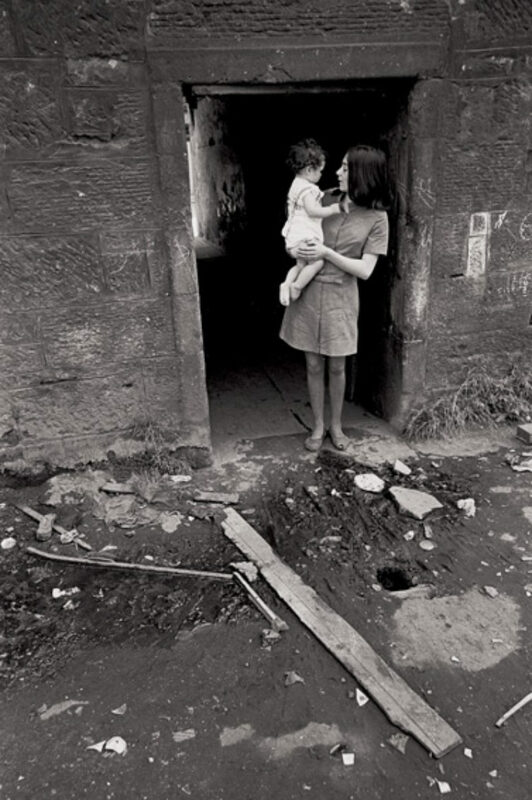 My dad photographed slums across Britain for Shelter in the late 60s. He said that the ones in Glasgow were the worst. 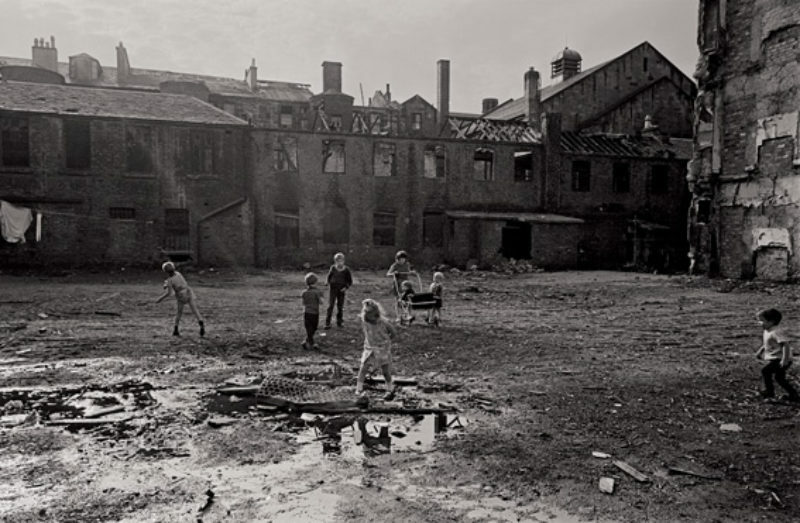 Looking at his pictures of the Gorbals again, it is hard to believe that people were allowed to live like this. 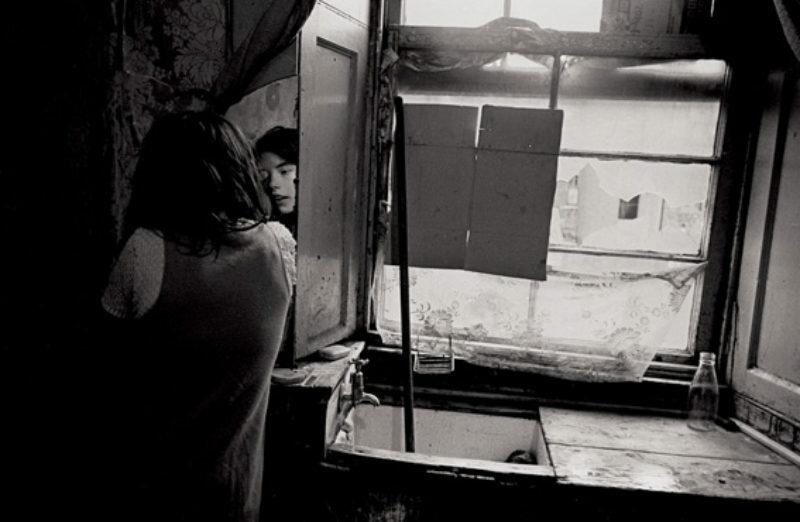 A girl puts on her eye make-up in a piece of a mirror, propped up by a window that’s broken and patched up with cardboard; children play in what looks like a blitz bombsite; a father holds his son in a worn chair while the plaster peels off the walls and clothes hang across a string. My father’s images were campaigning and clearly intended to motivate change, but revisiting them, I am struck by how unsensational and modest they are. They come from a time when poverty was something to be angry about and social realism in film, photography and theatre strove to address its profound hardship and debilitation. The work was always in the background of our family’s lives, but when you’re growing up, everything seems normal. It’s all you know and so, to a certain extent, not very interesting. 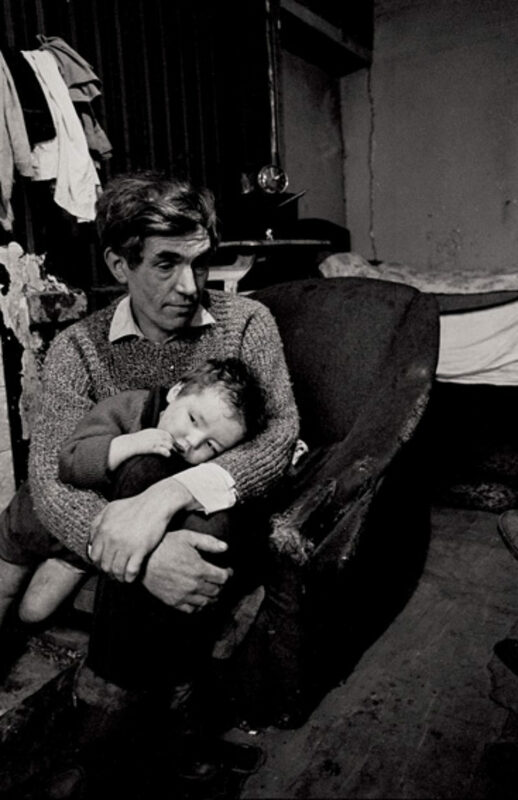 Somehow it was natural that he had spent his 20s and 30s being a freelance photographer, working for Shelter—documenting housing, factories, the major British cities—and had given it up to provide a home for his family. But leaving home changed things, and little by little, a respect and curiosity for him has grown in me over the years. 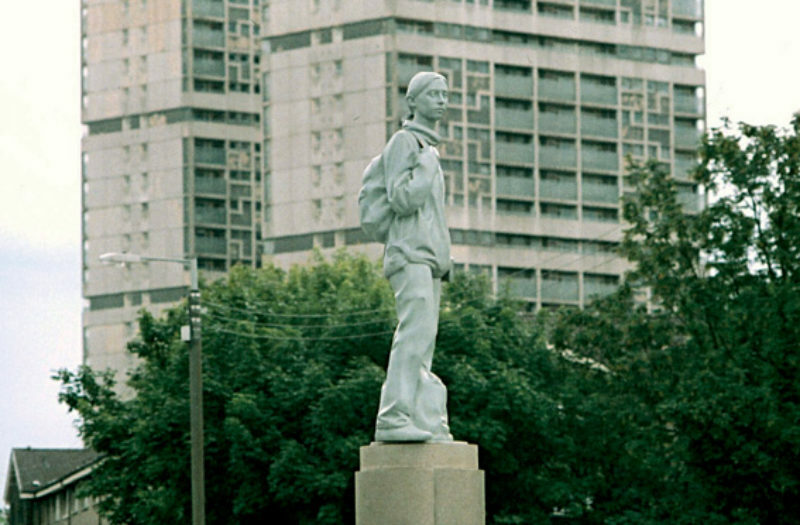 Is the fact that I’m standing, one windy day last October in the Gorbals, watching Kenny Hunter’s sculpture, ‘Girl with a Rucksack’, being lowered onto its plinth, anything to do with the boxes of contact sheets and glimpses into my dad’s early working life? Then there was that GCSE art project where Dad and I went to Toxteth in Liverpool and got shouted at for photographing some of the housing—they thought we were undercover drugs police. We were roughly the same age (a few decades apart)—25/26—when work took us to the Gorbals. The crumbling tenements my dad saw are now smart apartments with penthouses to boot, but all through its long history, the place has inspired cultural documentation. Scottish classic texts, including No Mean City by Alexander McArthur and H Kingsley Long, and Growing Up in the Gorbals by Ralph Glasser, are written documents of 50’s life in the Gorbals’ slums and in the 20s when 80,000 people lived there, while celebrated photographer Oscar Mazaroli captured tenement life in the 60s. The area has been inhabited from the 12th century. Ever since, it has been a point of destination for incomers—Highlanders came during the Clearances, the Irish moved in after the potato famine, and in the 30s it became a district for Jews escaping persecution from eastern Europe—part refuge, part ghetto. Housing over the last 150 years has gone through three distinct phases, starting with the 19th century tenements which were allowed to deteriorate into the shocking housing documented in photographs like my dad’s. These were razed to the ground in a late 60s’ and early 70s’ vision of modernity, and replaced with tower blocks designed by Basil Spence. The poor quality of these paeans to a brighter age meant they rose in damp, dirty decay and have almost all been systematically pulled down in the last few years to make way for the privately-financed low-rise blocks. Shelter, in its formative years, was producing reports on homelessness and bad housing in Glasgow, Newcastle, Manchester and Birmingham. ‘The thing about the tenement blocks, though, and you can see it in the architecture of some of the stairwells, is that they are extremely graceful,’ Dad says. ‘When they were built they were good flats.’ But the post-war housing policy encouraged the growth of new towns—East Kilbride and Cumbernauld were born. The concentration of money was fed into their utopian constructions, and areas close to the city centre, including the Gorbals and Maryhill, were run into the ground. Baker has struggled in his five years as lead artist with the conflicting interests of those laying claim to the Gorbals—developers, city council, present residents, future residents, architects, lawyers and himself and fellow artists. ‘We had to be very political and I’m not a political animal—I feel battered and bruised,’ he admits. The wall we’re sitting on, snaked by an steel frame two feet wide, which is planted with shrubs and trees, was a mini battle in itself. 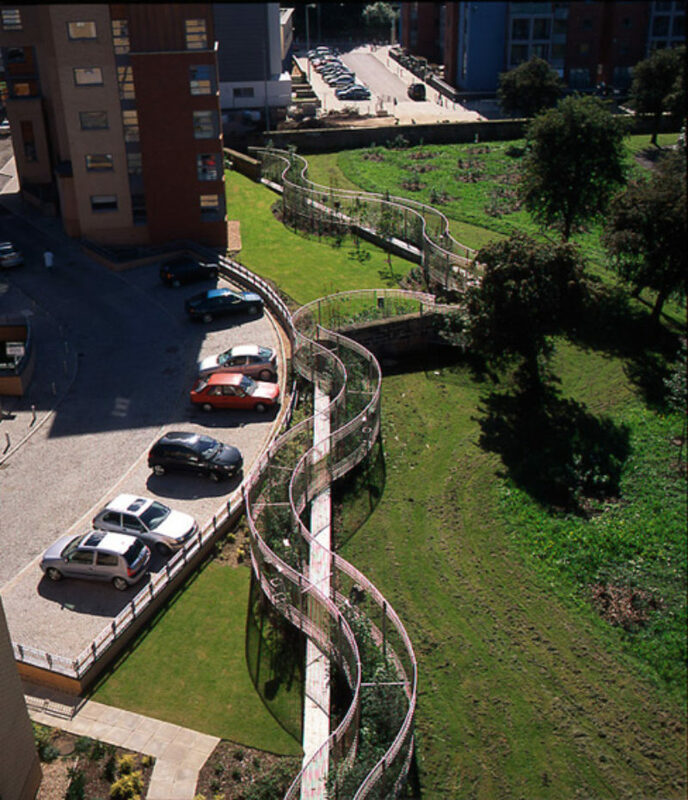 The victory scores the use of the wall as a resting place and ensures the inclusion of ancient stone in both the public and private spaces, which are slowly being divided as vegetation grows. They then did something called ‘Oaklands needs Pakora’ based on a ubiquitous piece of graffiti around the place. ‘We had a big party, and a van from a local Indian restaurant came around giving out pakoras—there was a band.’ The tactics anticipate the kind of happenings facilitated by Jeremy Deller, but as Baker admits, ‘It was like throwing a rock into a pond. As a human being I felt the need to hang around for a bit.’ This he did, while his relationship with Dubowitz catapulted between creative dynamite and destructive collisions—eventually leading to Dubowitz’s departure from the project. Their methods over this time, and those subsequently used by Baker, became very different. In 2000 they were asked by the head of the Crown Street Regeneration Project, Tom McCartney, to take over the Percent for Art scheme which he’d inherited and felt was being wasted. He gave them the whole budget and allowed it to be artist-led. This is a move that has not been replicated in any other Percent for Art scheme. ‘We set it up as an organic process. It was always meant to evolve. The theme was subtle, time-based work. Artists have created conditions with an idealism that they’re going to impact on the future,’ Baker says. Baker’s own flying woman, dangling on the corner of Caledonia Road and Cathcart Road, rather like the figurehead of a ship, has reportedly shed drops of blood from her palms, and the stigmata, along with her skyward position have earned her a local title of angel. She hangs above a large piece by Dubowitz, and collectively they are known as ‘The Gatekeeper’. It is, to be frank, a great shame that Dubowitz’s clunky and tacky work—a steel-framed, gold-tinted picture of a woman in white walking through a disused factory—dominates the space. It blocks what would be a clear view through, under Baker’s protective figure. Looking more at my dad’s photographs, I wonder if any of the residents in them could have imagined all these things happening to their homes. Despite the inflow of more affluent outsider stock, there are reports that people who once lived here and were re-housed are moving back, and a study is due to be published later this year about the response to public art. It will include substantial investigations into the Gorbals’ schemes, but perhaps their importance cannot be known for a while—it takes time to build a relationship. And that, in the end, is what is crucial about public art. It is something that people can develop a connection with and link it to their own specific sense of place. Documentation has also been an important part of the work for the Artworks programme—coupled with the drama of creating something. 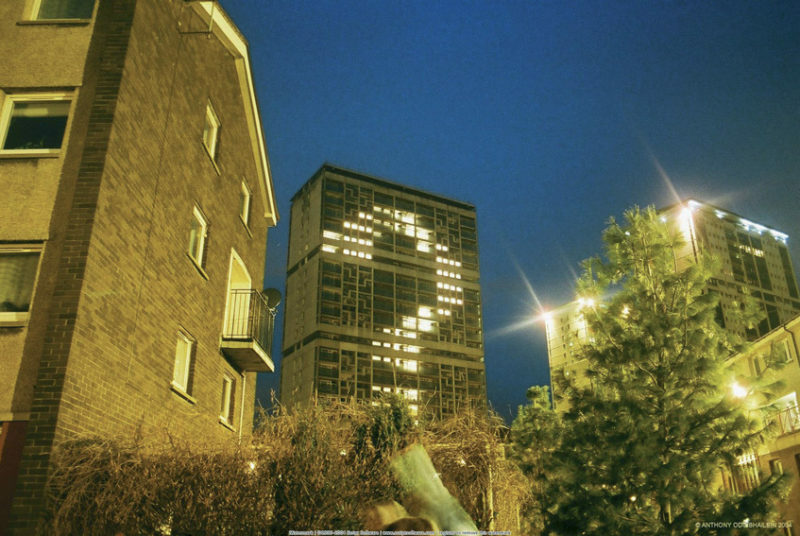 In March 2004 Peter Smith put lights in each window of a derelict tower and connected them up to a computer into which designs were programmed on the windows’ grid system— images were created and illuminated on a loop with a seven second delay. The scene was broadcast on TV and as people at home saw what was happening up the road they came out of the flats to watch the event. The Artwork’s itinerant programme has documentation of every stage of the regeneration. Predating them, Christina McBride projected statements onto one of the Basil Spence buildings that was about to be demolished, and following that Pete McCaughey projected images of the demolition onto the Twomax building. Then this year something extraordinary happened. The face of Emma Caldwell, the murdered prostitute, was projected for four hours between 10.30pm and 2.30am on 23 May onto a derelict block of flats in Cumberland Street in the Gorbals. ‘This site was specifically chosen because it would have been visible across areas where we know Emma and her associates were known to frequent until the early hours of the morning,’ Detective Superintendent Willie Johnston said. It is the first time police have used such methods. Could this piece of enlightened investigation have anything to do with the projects enacted elsewhere? It says something about the power of the architecture— its visibility and presence—that artists and police are using the empty façade to communicate a message. Drama, documentary and reality are coming together for a purpose, rooted very much in the real lives of the people who live there. Walking past the Somerfield supermarket on Crown Street, I’m surprised to hear it blasting out classical music at full volume, but apparently it keeps the junkies away. Matt and I sit down to have a plate of chips and cup of tea in the local café and a weariness comes across him that reminds me of my dad a few years ago. There is a zealouness—energy and belief—to both their early approaches, but three months wrangling over the protection of a wall among five years of mini battles, and 18 years of a government that erodes much of what you’ve worked for, takes its toll. What if they hadn’t done that work though? Housing may have crumbled around families while no-one knew; the private housing of the Gorbals may have just sprung up shiny and new, trading on an identity while erasing its core. There is a humanity in the work both have produced that gives it endurance. I have learned a great deal, and realise the seeds of my own enquiry and and purpose were sown a long time ago when I wasn’t even looking.